Forza Horizon 4 will feature the same Horizon Festival atmosphere you know and love, where you can participate in curated, customizable festival races to become a Horizon Superstar. However, that isn’t the only way to rise to the top of stardom in beautiful, historic Britain. In fact, the team at Playground Games have introduced new open-world activities to the game in the form of Horizon Stories. As revealed by Destructoid – who attended a behind-closed-doors demo of Forza Horizon 4 with Playground Games’ Art Director Ben Penrose, these Horizon Stories are a series of optional side-jobs, and one of them involves taking customers around the different towns, cities and landmarks of Great Britain. This means for the first time in the history of the series, your cars can have a passenger in them – providing they aren’t one-seated vehicles, of course. These narrative-based gameplay scenarios will see you meeting and engaging with quirky, memorable and colourful characters that are centered around certain activities. As well as having to buy a house to live in, you’ll also have the chance to own businesses, and one of these comes in the form of a taxi company, which leads to Crazy Taxi-inspired missions using the classic Austin FX4 London Taxi. 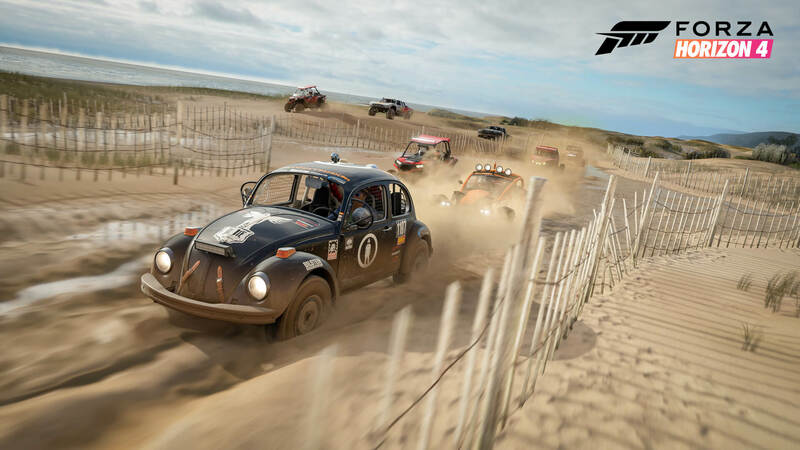 Forza Horizon 4’s unique story-based mode also associates itself with other racing games in its various narrative-based scenarios, and as mentioned already, one of those is based on the popular classic racing game, Crazy Taxi. Whilst no further details were provided, with Playground Games naturally wanting to keep as many of these Horizon Stories under-wraps as surprises for fans until launch, we do know other side-jobs will see you taking on the role of a stunt driver on a popular automotive magazine show and helping with a car documentary shoot, based from a comment on Playground’s Creative Director Ralph Fulton in an IGN interview from E3 2018. Meanwhile, purchasable properties in Forza Horizon 4 will range from a little cottage in the Cotswolds of South England to the extravagant Edinburgh Castle. You can leave your ride parked outside your house, which is where you can also explore it in immense detail using Forzavista. Here you can get up, close and personal with your favourite cars. You can also tune, upgrade and paint your vehicles from your property – and all these different features, as well as photography and Mixer livestreams, will allow you to further progress in Forza Horizon 4. The game rewards you based on how you want to play so you can live the ‘Horizon Life’ of your dreams. Forza Horizon 4 will be available on October 2nd, 2018 for Xbox One, Windows 10 PC and Xbox Game Pass. The Ultimate Edition, which is now available to pre-order worldwide, includes access to a revamped Car Pass, the VIP Membership with bonus Car Packs – including one themed around Formula Drift, as well as two post-launch expansions, which will take players to all-new locations whilst introducing new cars, features and events to enjoy. For more on Forza Horizon 4, don’t miss our deep look at how its seasonal-based gameplay changes everything.